Subaru hopes the all-new 2019 Subaru Ascent 3-Row will start a new cult following with families. Subaru vehicles like the WRX STI, Forester, and upcoming Crosstrek have quite a cult following among their owners, and now Subaru wants families to start one with the all-new Ascent 3-Row vehicle. It’s coming next summer, and Subaru is looking for the new 3-Row hauler to be a big hit with families. Upwards of 60 percent of Subaru’s sales come from the U.S. and according to a recent report by Subaru Corporation, they expect to grow 5 percent this year to 680,000 cars sold, compared with the 648,000 delivered in 2017. Why is Subaru optimistic while other automakers are expecting a decline in 2018? The additional 32,000 vehicle sales will likely come from the all-new 2019 Subaru Ascent 3-Row crossover coming later this summer. Subaru has outpaced the competition in the U.S. using a stable of cult-like all-wheel-drive vehicles to reap the benefits as consumer’ tastes have shifted towards sport-utility vehicles. Subaru is now a major player and has seen its sales more than triple in the last decade. Also getting the new Ascent, the Japanese automaker expects Canada to grow 4 percent, Australia 2 percent, while sales in Japan will decline 11 percent. The company is expecting continued demand for the 2018 Crosstrek, and is anticipating a big bump from its all-new, 3-Row 2019 Subaru Ascent, the largest vehicle Subaru Corp has ever produced. It will be made in the U.S. at their plant in Lafayette, Indiana and they hope to produce enough for North Americans. The family-sized Ascent comes with flexible seating for up to eight passengers, features standard Symmetrical all-wheel drive, and can tow up to 5,000 pounds, more than any other Subaru vehicle. And for the first time, Subaru’s EyeSight driver assist technology will come standard on this vehicle. The all-new 2019 Ascent also includes a host of in-vehicle technologies including Subaru Starlink Multimedia and Starlink Safety and Security services for consumers. The all-new 2019 Subaru Ascent will begin production the first quarter 2018 and Subaru is optimistic the 3-Row family hauler will be a big hit with North Americans. 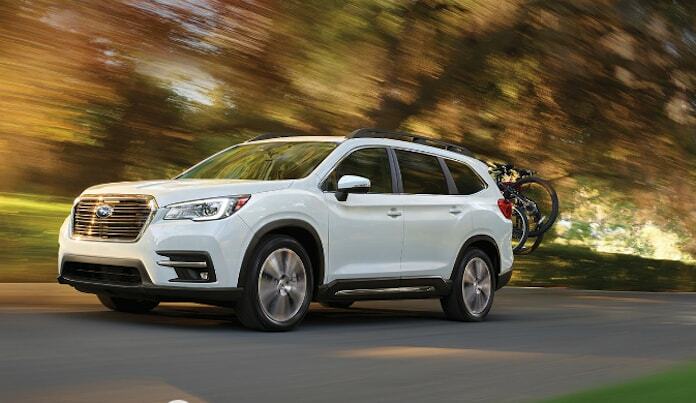 Subaru wants families to start a new Ascent cult following as it goes on sale this summer. Just from the reveal and the specs, Subaru seems to have a winner with this design. I was at the New England International Auto Show this past weekend - looking for a replacement for our family workhorse Mazda CX-9. After previewing each available mid-size 3-row cross-over/SUV, we determined that the Atlas is too big, the Q7 and QX60 too gasoline-thirsty, the Pathfinder, XC90, Lexus RX and Acura MDX too small, and the CX-9 has reduced it's Cargo capactiy from our 2012 model by nearly 30%. It seems that the Highlander and Pilot come closest to what we need. From the specs, Ascent will beat them both out, as it will likely offer the safety and premium features of the near-$50K Pilot Elite for much less, and will provide better cargo space than the Highlander - while beating both in gas mileage. Could someone please let me know how to get to the front of the line at the Subaru dealer for this one? thanks Mr. Denis for this report, do you have any idea when they release fuel-economy figures? also what your though about fuel type? do you think will be regular fuel as same of all competitors or will be Premium Fuel same as Forester XT? cause Forester XT have same fuel system as Subaru Ascent has. Usually automakers release fuel-economy numbers closer to dealer launch Big Engines. This should be sometime this summer. Great question about fuel type. Because it's turbocharged and runs high compression (10.6:1), it may require premium fuel. We will let our readers know as soon as we find out. Thanks for reading! But Subaru Impreza 2017 & Crosstrek 2018 are compression (12.5:1) and it's use regular fuel! is it high compression right? so if they are higher than the Forester XT why they use regular fuel? Our guess is, it will also use regular unleaded fuel too because of the direct-injection technology Big Engines! I previewed the Ascent at the Philadelphia Auto show - I was impressed. However, I wish they would have kept the prototype tail lights, that would make it stand out from the pack. My other issues were minor - would have liked automatic folding side mirrors and I'm guessing not much in the way of ambient lighting (for night driving) cup holders or door panels (at least for the driver and front passenger). Lastly, I wish they'd offer Dark Blue Pearl like the Outback. The plus would be regular fuel and I'd trade that for the other minor issues.